Sometimes the best restaurant experiences can be found in seemingly staple and familiar environments. While I consider myself to be a bit of a foodie in the sense that I love flavor, quality, and anything new to taste, I've also always been a sucker for diners, especially when I have a craving for breakfast food anytime after 9 a.m. Diners, while all a little different in appearance, manage to still have that same menu, that same half-burnt coffee, and those same sticky placemats. All except the Summer House Café. While The Summer House Café, like many other diners, also offers a lunch menu, and a dinner menu Thursdays through Saturdays, I typically visit this establishment for a variety of breakfast delights. On a late Sunday morning – much like the one upon which my guests and I set off in search of some quality diner-breakfast eats – one can expect to find the place packed and the waitresses shifting about in expected form and chatty and hungry mouths of no particular demographic comfortably occupying all of the art-filled nooks and crannies of this uniquely bohemian diner. Now, like I said, I'm a sucker for diners because of a few familiar staples that even from which the Summer House is not set apart. One such staple is the bottomless cup of diner coffee that's not particularly strong, nor flavorful, but always there with a waitress successful at keeping it warmed up. Another diner quality that The Summer House possesses is a fast and predictable pace. Sometimes it can be a little too fast for how relaxed the rest of the restaurant setting is. However, as it becomes evident that my table is in the exact opposite of a rush, our waitress eventually, and graciously, adapts to our pace. So what's not so familiar about this dining experience? Looking at the menu, one will find multiple omelet options with numerous fillings, "2 eggs and meat" combos, as well as classically sweet breakfast treats, such as waffles and French toast, which all seem pretty standard and expected. But then after further exploration, dishes like "Eggs ala Dante," "Grilled Roma Tomatoes," and "Eggs Florentine" start to make their presence known, distinguishing Summer House from the crowd of greasy spoons. At this point, I'm going to pause and recommend a dish for which I frequently return to The Summer House. If anyone out there likes sausage gravy, then the "Heavenly Biscuits" are for you. This dish – consisting of flakey, slightly sweet biscuits covered in a rich homemade creamy sausage gravy – sets The Summer House apart from most other diners I know. But back to our Sunday morning breakfast. My table starts out with the "Breakfast Breads Basket," containing an assortment of fresh homemade biscuits and muffins. While the biscuits were deliciously fresh – despite the butter having been served frozen – I would not recommend ordering this starter unless you're simply meeting a friend for coffee and need a little something to pick at while you chat. After all, who wants to fill up on bread – no matter how good – before a meal? While the rest of my table proceeded to order classic eggs and omelets, I went for another menu item that I specifically seek out from The Summer House: sour cream pancakes. It's considered a win for a restaurant when there is a particular dish for which customers return because they just can't get it anywhere else. For me, that can be found in Summer House's pancake. I foolishly order a double-stack of the richest, creamiest pancakes I've ever had in a diner, along with a side of bacon. Who doesn't like a little salty with their sweet after all? Summer House offers a long list of toppings that can be added to your stack for an upcharge, but to be honest, they are perfect with the powdered sugar and the slice of strawberry with which they already come. To put it as politely as possible, many diner pancakes often tend to be a bit "gritty," but this stack is thick, golden-brown, and not only grit-free, but creamy and smooth in each bite. 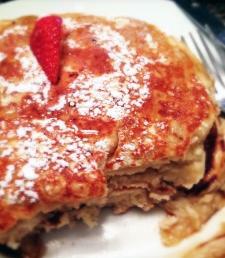 Two pancakes are too much this particular morning, but delicious all the same. While the rest of my table is satisfied with their classically egg-y diner dishes, particularly the fresh veggie fillings in the omelets, it's evident that the Summer House's strengths can be found in the dishes that make it unique. Sour cream pancakes, and biscuits with sausage gravy are total spotlight stealers that manage to break the diner menu mold. While a cup of coffee along with two eggs, meat, and potatoes always sounds appealing, a patron of this diner will walk away with a more memorable meal if he or she opts for something more robust than a simple plate of eggs from this menu – something that he or she may just start coming back for again and again. Contact The Reader Eater at ReaderEater@ErieReader.com.